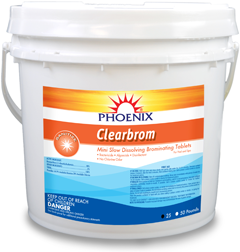 Phoenix ClearBrom - Phoenix Products Co.Phoenix Products Co.
ClearBrom is a 1 inch Bromine tablet that is excellent for commercial and residential indoor and outdoor spas. Also works great for indoor pools! It has a very low non-offensive odor. It can be used in a bromine feeder, dropped in a floater, or just added to the skimmer. Compatible with all pool and spa surfaces. Available In 25LB and 50LB. Available In 25LB and 50LB.